COLORS: Depending on your computer, colors may appear differently! See image of the entire color sheet to help you select colors. Color card recommended for more exact color matching, available at bottom of page. 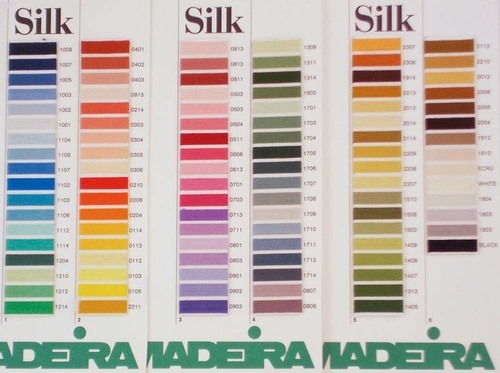 Madeira silk embroidery floss, used for fine embroidery, is also just the right silk for braiding, especially with the disk or plate! From Madeira threads: a thick, lustrous, silk 4 strand embroidery floss, about the same size as a #5 pearl cotton. If you are braiding an eight strand, two color braid, with each strand about a yard long, you need only one pack of each color to complete your braid. A four color, sixteen strand braid would need one pack of each color. A photocopy sheet showing all the colors of the silk floss.